In this side-scrolling action game, you play as Scarygirl – a girl who has been adopted by a giant intelligent octopus and is trying to figure out who the man haunting her dreams is. Traverse unique, extremely vibrant, colorful, and magical worlds in a seamless mix of 2D and 3D platforming action. You can go it alone in single-player mode or grab a friend and team up in co-op gameplay and fight alongside Bunniguru – the giant kung-fu rabbit. And as you advance, you’ll be able to purchase new weapons and new moves, and discover countless secrets along the way. It’s a mesmerizing fairytale, but the creepy-cute tough-as-nails Scarygirl is no damsel in distress! Amazing Art and Design: Surreal landscape and creatures are beautifully fantastical, created by a critically-acclaimed, award-winning artist and true to the art style that Scarygirl fans have already fallen in love with. A Curiously Wonderful Stand-Alone Chapter: The game features a new and exceptional storyline separate from the graphic novel and planned feature film, in which Scarygirl finally meets the mysterious man haunting her dreams. New Moves, Weapons & Upgrades: The game’s upgrade and combat improvement system allows Scarygirl to grow beyond her basic attacks by purchasing new moves, like an the “Anaconda Squeeze” and “Morph Tendrils”, or attachments for her tentacle arm, such as the Rage Hook. Co-Operative Play: While one player controls Scarygirl, a second can bring Bunniguru’s furious “Fists of Blurry” into the fray at any time. This offline feature allows the two characters to perform special moves together to overcome major challenges. 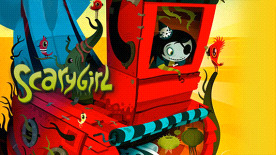 ScaryGirl © 2011, TikGames, LLC. Created under license by Passion Pictures Australia/Film Victoria. SCARYGIRL is a trademark of Nathan Jurevicius. TikGames and the TikGames logo are registered trademarks or trademarks of TikGames, LLC. SQUARE ENIX and the SQUARE ENIX logo are registered trademarks or trademarks of Square Enix Holdings Co., Ltd.